Did you know that cancer in dogs and cats is as common as it is in people? Reuben the rottweiler began limping on his left front leg in September. After being diagnosed with a type of bone cancer, he received surgery to his leg and chemotherapy. 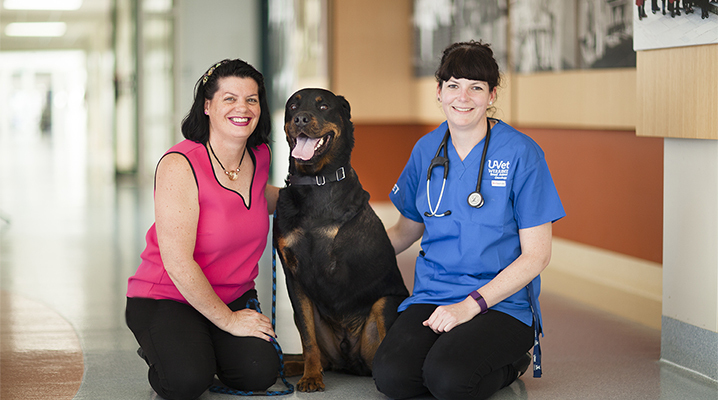 Reuben the rottweiler began limping on his left front leg in September. After being diagnosed with a type of bone cancer, he received surgery to his leg and chemotherapy. While his owner Sharon recalls the first couple of weeks being tough, he is now functioning well with three legs and began chemotherapy. Bone cancer is common for dogs, especially in large breeds like rottweilers. Amputation is an important part of treatment as it removes the source of pain. Though it might sound frightening, most dogs and cats adjust well with three legs. Reuben is a good example of how well dogs can adapt to their new ‘tripod’ life and do most of his normal activities. Reuben is a six-year-old rottweiler who presented to the U-Vet Surgery service for evaluation of suspected osteosarcoma. He initially presented to his regular veterinarian for left forelimb lameness, which was becoming progressively worse over the last two months despite medication with NSAIDs. Radiographs were concerning for an aggressive bone lesion in the left proximal humerus. Chest radiographs showed no evidence of gross metastasis. Fine needle aspirate of the area was attempted, and cytology was inconclusive. Most of the cells were consistent with relatively normal osteoblasts though there were some larger more atypical cells present. On orthopaedic examination at U-Vet, pain was localised to the left shoulder region. Given the classic breed, location and radiographic appearance and the absence of evidence of inflammation, infection or secondary neoplastic processes on cytology, a presumptive diagnosis of osteosarcoma was made Reuben went on to have a left forequarter amputation and histopathology confirmed the diagnosis of osteosarcoma. Reuben is getting around well on three legs and has started chemotherapy treatment with the U-Vet Oncology service. Many vets are unsure if they need a definitive histopathologic biopsy diagnosis before proceeding to amputation surgery. A presumptive diagnosis of primary bone tumour can be made based on typical signalment (breed, age, anatomic location) and typical radiographic findings (mixed lytic – productive pattern). Osteosarcoma represents approximately 80% of primary bone tumours in dogs. For cases of suspected bone tumour, the biggest things to rule out prior to surgery are those where amputation may not be recommended – i.e. secondary tumours (carcinoma being the most common tumours that metastasise to bone), or infectious diseases. These can often be largely ruled out based on history, physical examination, radiographic appearance, and ideally cytology. FNA cytology can be a useful diagnostic test to determine neoplasia versus non-neoplastic disease, which can allow owners more comfort to proceed with a major surgery such as amputation. If an adequate sample can be obtained, useful information is gained from cytology in the majority of cases. Choosing the most lytic area of the lesion based on radiographs and moving the needle around until you feel it ‘sink’ into the bone can help with getting a diagnostic sample. Ultrasound can also help to directly identify areas of lysis and guide FNA. In lesions where there is minimal or no cortical lysis then FNA may not be as useful a test. ALP staining on cytology slides can be used to confirm osteoblastic origin Performing a bone biopsy requires general anaesthesia and results can be expected to take a minimum of 7 days to be available which delays definitive treatment, and there is a potential increased risk of pathologic fracture. Most dogs, including large and giant breed dogs, function extremely well after amputation. Relative contraindication for amputation include other concurrent orthopaedic disease (e.g. cruciate disease, moderate to severe OA), obesity or neurological conditions (e.g. lumbosacral disease. degenerative myelopathy). Chemotherapy is recommended following amputation in canine osteosarcoma, and usually starts about 2 weeks after amputation. The most commonly used drug is carboplatin, but combination protocols with doxorubicin are also used. Usually a total 4-6 treatments are given at 3 week intervals. Again, most dogs tolerate chemotherapy very well with minimal side effects. The addition of chemotherapy as part of a multimodality treatment approach to osteosarcoma increases median survival time from 3-5 months with amputation alone to 10-12 months in dogs without visible metastatic disease at the time of amputation. A novel treatment for canine osteosarcoma using HER2 targeted immunotherapy in combination with surgery and chemotherapy is showing great early promise and is currently in development in the USA – no information as yet on when or if it will be available in Australia, but it is an intriguing area of research!